How interesting God created us and wired us all so differently yet so the same. My sleep patterns for now has been quite hmm..normal...in the sense that i sleep and wake up at about the same time all the time. Obviously my wake up times is pegged to Eliza's one. But i still sleep at anytime from 12-2am. Hardly earlier. Maybe at 11pm+ on some days when i'm really tired. We aren't made to be robots. Really. When Eliza went to quite a predictable patten for bedtime, i was already wondering when she'll start changing her pattern. After saying good night and hugs and kisses to everyone in the house, we'll start with picking her books for bedtime read to be left on the bed. 3. Then we'll go brush teeth (today i added a sit on potty to 'pee' with me). 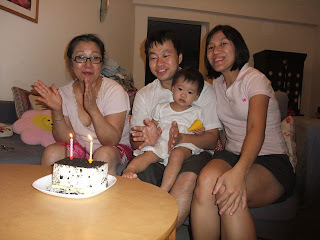 These days after we came back from Phuket, she seemed to develop a fear of sleeping with the lights out so Step.7 is skipped. We also skipp step.8 & 9. which i usually use to transit her to go into bed. So these few days i'll continue the book reading in her bed till she finished her books. and it's time to sleep. Somehow the book reading has extended bedtime about 15mins longer than usual...and she has been waking up at 6am+ for milk, falling back to sleep till about 8am+. I kinda like that cos i get to sleep in this holidays. :) Just don't know how long this will last! I felt like i was busy all the way to Christmas, or i just didn't have much mood to update the blog cos there was other stuff to do. 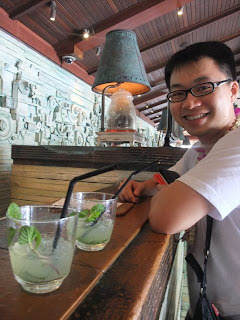 We had a great time at Phuket, so much so that we felt that the trip was just too short! The resort was really just too fantastic and even if you don't go out exploring the island like what we did, you could stay there all day. 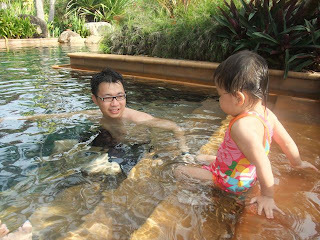 The pools were so relaxing & fun, the beach so enticing! We could have gone to the more popular places but somehow we did a road trip thing and drove all around the island (and got lost a few times). 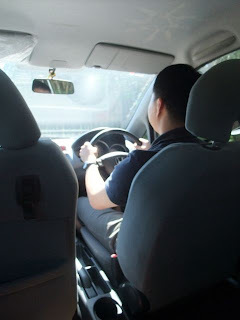 Ww loved the Honda Jazz that was rented for 1200 baht a day, we topped up the 1/2 tank of petrol but the car was so fuel efficient that we only used 1/4 tank! argh. 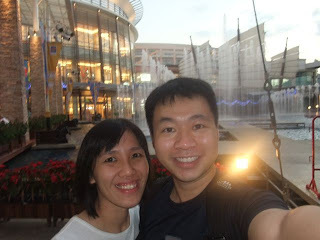 We basically checked out Patong beach, the Viewpoint, Phuket Aquarium, TongSai Waterfall and some beaches. 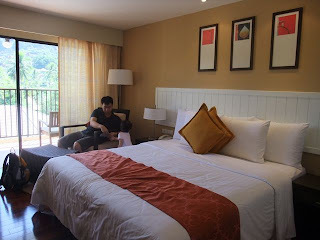 We'll love to go back there again and check out the more ulu but beautiful beaches, Phiphi island & stay there a night, stay a few more days at Maikao beach (the Marriot resorts there are super huge! 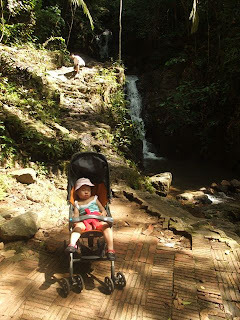 ), check out the other waterfall and maybe try a trek (we couldn't cos Eliza was zzzing in her stroller), maybe go see the Sunset at Sunset bay. If we don't go overseas for studies next year, i may try to convince Ww to go. hoho. Thank God it was a short flight, so i whipped out all my bag of tricks to keep Eliza occupied. Of course the eating part was the most fun but accident prone part (think food and spoon all over the place). 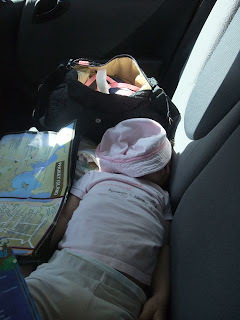 My backseat buddy...mostly sleeping for long drives. Courtyard at Surin. comfy and huge. of course the water slide was fun for all of us. Eliza refused to stop...she kept wanting to go down the slide even after we did that countless times. Lunch at Surin. Don't u love those pretty umbrellas...looks quite japanese. Eliza was snatching the fries before we gobble them all up. We didnt' expect out food to come with fries and Eliza was still recovering from her cough/runny nose...so she wasn't supposed to eat them. 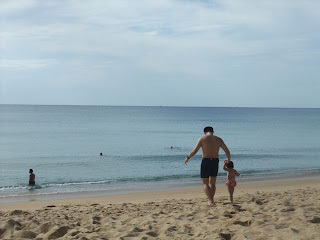 This is Surin beach, the sea literally roared all the time. 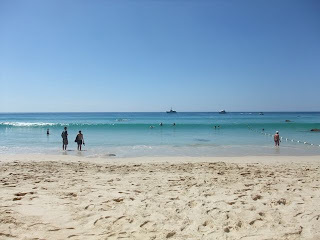 So we admired the beach from afar most of the time, wasn't too keen on dipping, also cos it was not recommended to swim. Still u see a lot of ppl in the sea anyway. 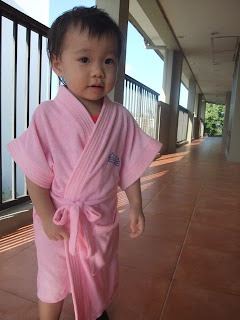 The first and last time Eliza wears the robe....cos it signals that it's time to get out of the pool, which she obviously doesn't want. Jungcelon, Patong very big mall. We stopped there for dinner and to stock up on water. anyway we realized we were such water guzzlers that we needed 4litres a day...almost. We stopped by at Kamala beach. 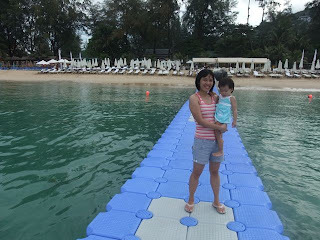 Ended up in the late mornign at Patong for a swim and sand play. 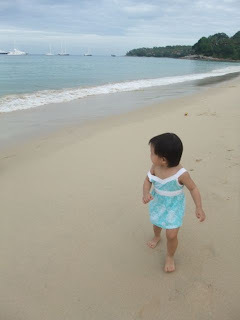 Eliza was picking up sea shells. 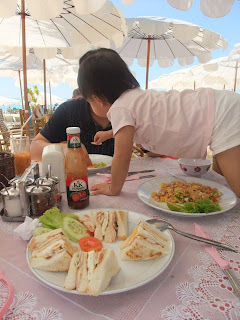 After Patong beach we were going around the island, popping by at the Viewpoint, some ulu beach which we thought was the Sunset viewpoint, drove along the east side of phuket and to phuket town. We got quite lost trying to find our way to Phuket Aquarium cos i couldn't gauge the distance in the map and the wasn't much road signs to guide you. We eventually stopped at the petrol station to ask for directions. haha..so amazing race. this is my fav fish at the phuket aquarium...cos it was quite silly. 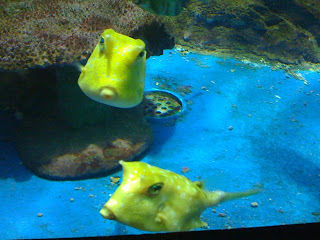 2-horned cow fish. Many funny silly fishes that put us in awe of God's amazing creation. 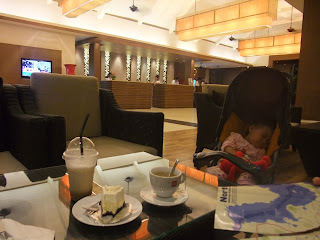 Our fav thing to do...coffee and dessert after Eliza falls off to sleep in her night stroll. She wouldn't sleep in the bedroom cos she'll either be too distracted or too afraid. So we stroll her to sleep. thank God she's back on routine back home after all the cut backs in our routines. Walked across the floating jetty...and we walked all the way to the end cos Eliza insists on walking all the way to the end. 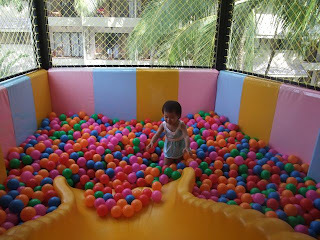 Kids world at Courtyard at Surin. How could we miss this? If only we had more time for Eliza to hang around there. The disappointing Tong Sai waterfall. disappointing cos we couldn't trek up further and that it cost us 200baht per person per entry. Not cheap! Checking in at JW Marriott with flower garlands and refreshing drink. 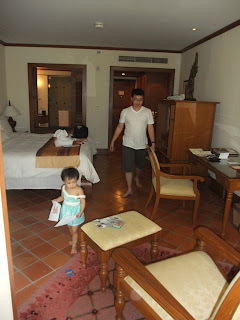 We were quite early and had to wait about 2hrs for our room to be ready. So we went to have lunch and explored the place a bit. 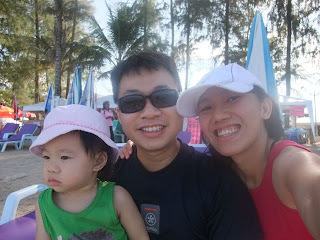 Going for a dip at MaiKao beach, the waves were really strong but we enjoyed it loads. Eliza was laughing at Ww for being 'crashed' by the wave. Some were so big you could see the rip curl. Quite exicitng! 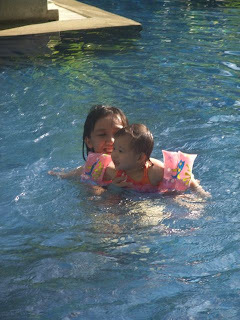 How could we miss a dip at the other pools...this is only one of the 3 pools at the resort. Eliza loved this steps part. We'll be back again! I'm not sure if Eliza remembers all these but at least she can see the photos next time and know that she was there...and really enjoyed it. 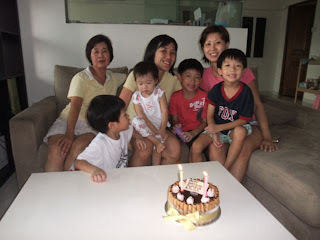 It was a happy day everyday, really, imagine snacking all day, swimming everyday, playing in the huge toylands. 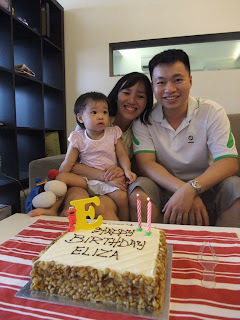 We had a great time too, especially with Eliza. 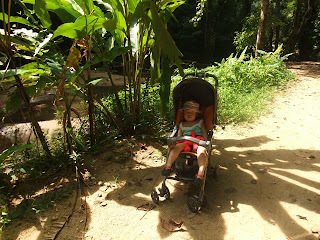 There were places we would have gone (the Island tour) or done without Eliza along and our schedules were shorter to accommodate her sleep times; our luggage was mostly her stuff (food, clothes, logistics, stuff), but with her it made the trip all the fun. I loved playing at the Kids world with her too! Nevertheless, like we always say, we can't help but want to bring her along to travel wherever we go, cos she's so fun to be with and we know she'll enjoy it too. I love snoozing on weekends (which starts on friday) even after Eliza wakes up at about 7-730am. I'll usually go to the kitchen, make milk for her, and plop back to snooze/sleep while she finishes up her milk. Usually she'll pop off outside to read her books or play with her toys...and i'll enjoy my snooze for 1/2 to 1hr more. And Ww was also still in bed so she looked at him while i was trying to get up and commanded him: " daddy sleep~~ "
obviously, Ww was happily plop back to enjoy his privilege to sleep. there goes the end of my snoozing mornings. and another bigger celebration with our cell groups and '81 gang of friends. So much for the practice...she got the gitz of birthday celebrations. I've always been quite particular about getting Eliza sleep enough and in routine. Of course, like every other human being, we deviate from the norm sometimes. Still...i do enforce the usual nap & sleep times, which of course Eliza doesn't complain about cos she is tired by then anyway. The problem with sleep is also that Eliza's growing and her sleep needs changes as she grows so we've gotta make adjustments here and there. I think one of the fears is that her lack of sleep will make everything and everyone else irritable. Of all the 365x2 days we've been though, i have tried and test (in a way), and agree with what many books/experts say about lack of sleep. Saturday afternoons are the worst...cos when Eliza's cousins are here and they don't nap, it is quite a challenge to get her to her room to sleep. She'll want to join them, and hearing their shouts and loud voices outside her room doesn't help a bit at all. Somehow kids don't quite have the capacity to control their volumes is it? We always remind the boys but they still shout across the house. So we always end up with Eliza crying and throwing tantrums cos she's not allowed to go out and play. Still she sleeps eventually, after being so exhausted from all that tussle. Eliza used to eventually fall asleep at 10pm+. (that's after taking 1hr to fall asleep) and yet wake up at 7am. So if i start bedtime later, she falls asleep even later. That also means that i have less 'peaceful' time before my own bedtime. Nowadays, since she has dropped her 2nd nap, she's able to be sent to bedtime at 8pm and fall asleep by 830pm, and most of the time wake up at 7+am the next day. So sleeping early doesn't always equate to waking up early. Really. That was one of my mil's concerns when i set her off to sleep really early. And that's one of the not so logical thing that i've learnt. Early bedtime also means that i do get less time with her after work. The earliest i can get home is 730am. And like today when i'm home slightly later at 8pm, i'm left with so called 1/2hour to bathe, eat dinner, play with her, get her to drink her milk and supposedly go to the room for bedtime by 830pm. Oh but i missed her so much that i played cooking with her a little more till 9pm. It was more difficult to sleep, compared to her super smooth bedtime the past few days. She wanted to go out, wanted to ask for my mil, wanted daddy...etc requests which i had to deflect and distract. I knew letting her out of the room is a recipe for disaster (ok i'm exaggerating..but it just gets her excited again and result in the nap example i mentioned earlier). I honestly think that i'm one of the selected mums that has her kid wanting to make contact in the middle of the night, even at 2yrs of age. Eliza on an average wakes up 1.5 times. There are good and bad times. Of course there had been exceptional days when she slept right through, there have also been days when she wakes up and makes a din. One of the the problems with the nights was her scratching. We've been through this scratch to sleep period which is now a rare occourance, by the grace of God. This really cuts down the time she takes to go to sleep. But she still wakes up at night to scratch, though much lesser already. The key to this was partially, the heat. We turned on the air-con everynight nowadays (except these few days cos our air-con is spoilt). That helped. Though i think she somehow grew out of it and God answered my prayers. She still scratches when she wakes up and takes time to fall back to sleep....but at least it's not as often as before. The other night wakings was her request for milk. It was an issue before and recently she has been asking for it again. Sometimes i do give her milk cos she has missed her nighttime milk or i felt she didn't eat enough during the day. Else, i would go out and give her water in her milk bottle. 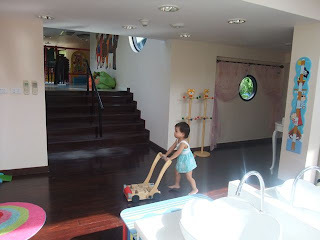 Recently, after a discipline issue that Ww and I had a disagreement on, when Eliza was defiant on keeping her toys, i realized that i forgot all about the "staying put" method which we did use when we were going through the 'night milk wakings' previously. I tried it again with the night wakings for milk; Stayed put and refused to go out to get milk until she was tired of crying and struggling. 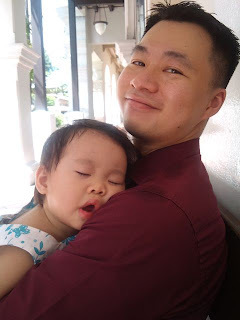 All the while, i was carrying her and hugging her, occasionally telling her that there's no drinking of milk in the middle of the night. I knew she doesn't want milk and all she wants was to go out of the room, and the only way for her to do so was to ask for milk. Eventually she'll lean her head on my shoulder while i sang and rocked her till she's more calmed down and ready to go back to sleep. It was a tough 2 nights but we had much better 2 nights after that. I was prepared to do that for a week! but i guess she got the point after 2 nights. Still i'm prepared that she might forget it and we have to do that all over again. I guess we have to suffer a bit before we can have a break through...else we'll be suffering for life! (ok almost) Ww told me of his friend whose 5yr old daughter still waking up at 5am+ for milk...i don't want to be still doing that when Eliza's 5yrs old! That should keep me on my toes. I'm learning still, learning to let go, learning when to stay firm, and learning to be consistent. Eliza's been doing a lot of narrating & pointing out things that she sees. It quite fun listening to her talk to herself or sing to herself. Her Elmo song goes like this "lalalalalalla Elmo song....lalalalalaalal Elmo song" quite like the song anyway, just that it's not exactly the tune. She's also practicing singing/saying her abcs. So i'll catch her saying the end part of it or the middle part of it or the front part of it. She misses some of the letters in between, though with some practice, she managed to add in the 'E,F,G' letters. She's also reciting her numbers, mostly in english though, as i don't always count in chinese when we walk up / down the stairs. Even so, there are some pronouncation that gets lost and she probably hasn't reached the developmental level to say it correctly yet. Even the most commonly used word gets mished mashed up in the babbler that sometimes i don't understand that she's saying 'milk'! So it's really important for me to label things, as in tell her what this is or what the action is etc, so that she can identify and tell it to me, if needed. She really catches on fast anyway. And with practice, she picks it up very quickly. The funny part is her Chinese...she does get some of the 音 correct, i like "爱你" (which daddy has been practicing hard to get her to say). and some words like "晚安" sounds like wan1an3. Of course her fav words are "Ai Mai?". and she has been talking to herself the past few days saying "Ai Mai? Ai"
I just wonder whether some of the intonations and style of saying things are caught on from me when i speak to her. Cos sometimes she sounds quite singsong in her talking...i'm not sure how to describe that...i guess u just gotta hear her to know.